When I was asked to come and spend a couple of days in Baku to address some issues on our projects the timing could not have been better. Not only did it fill a few days between my meetings in Paris and my mission to China, but more importantly it meant that I could participate in the Baku triathlon! Azerbaijan is famous for its oil fields and there is a large expatriate community here–most of which seem to work for BP. I found the ‘Baku Bicycle Club’ on the Internet and joined their mailing list which is how I learned of the Baku triathlon. 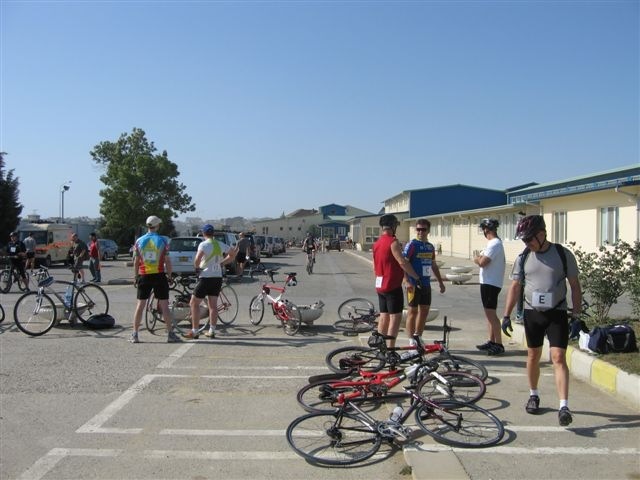 An annual event, it consists of a 500 m swim, 12 mile bike ride and 3 mile run so is sort of a sprint triathlon. I arrived from Paris and got to the hotel at 21:30 the night before the race. 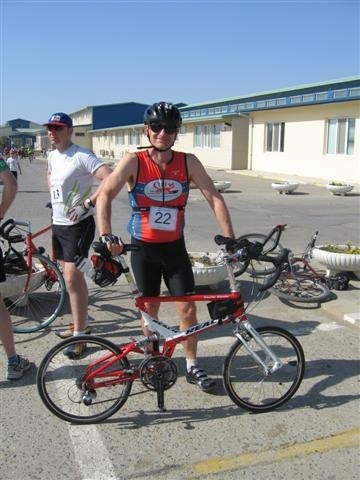 I assembled my bike while keeping an eye on the film ‘Rocky Balboa’ – inspiring for an aging triathlete like me. I’m getting used to assembling the bike but unfortunately my watch holder got damaged so I will need to fix it somehow before Ironman Switzerland. The race was unusual insofar as the swim was held separately to the race. Most people swam the day before at the Park Hyatt pool. The bike/run was to be held today. Since I arrived after the pool closed I was in the pool at 7:30 and after a short warmup did the 500 m swim. My time of 10:17 would dictate when I started with the bike. I am certain that the pool is longer than 25 m as both my time and stoke count suggest about 30 m. Anyway, at least I would have the same relative time as the other competitors. I was collected at 8:30 by Ella who was also competing. She had kindly offered to give me a lift to the race since she lived near the hotel. The race was in a gated community on the outskirts of Baku where BP’s staff live. We got close but then found that the road was closed due to construction. We spent the next hour dead reckoning it to try and find the place. Fortunately, Ella learned Russian when she grew up in Albania so was able to ask for directions from locals. Eventually we found our way to the start. There were about 50 competitors, a number of which were teams, so the total number was about 75+. Almost all were expatriates, somehow connected with the oil industry. The transition zone was at the International School in the middle of the compound and was pretty relaxed as this photo shows . The race was simple: 12 laps of the block around the school for the bike ride followed by 3 laps for the run. The pre-race instructions were fairly simple: watch out for the speed bumps, careful on the corners, be sure to count the number of laps you’ve done as they won’t, be honest, don’t draft, warn when passing. And above all, have fun. We lined up in order of our swim times and checked the bike of the people behind us. My funny bike of course elicited a lot of comments. The starter then counted down and we were off. The name Baku means something like ‘windy city’ and that is no misnomer. The winds were very strong and, unfortunately, we coupled with a very steep hill. I was glad that I had my aero bars as it was head down and grind you way along through the wind and up the hill. A lot of people were on mountain bikes – which given the road condition is a good idea – and it was impressive how fast some of them were. The speed bumps were particularly disconcerting – especially when one of them caused my speedometer to fall off the bike! I had to s top, go back and collect it again. It also got turned off for a while but at least I was able to keep track of the laps and stopped after lap 12. I only managed an average of 16.5 mph for the ride – at least the bit that was recorded – but given the hills and wind I was happy with that. The run was three laps which went in the opposite direction to the ride. We started up a steep hill and, once crested, it was downhill. The run wasn’t too bad at all and I managed a 7:36 pace which gave me a 1:17:10 (10:17 swim; 43:52 ride; 23:01 run) for the race. Ella finished some time afterward, but given she was out partying all night that was very respectable. Ella mentioned that she was a hasher and that there was one on in the afternoon. Unfortuantely, I had missed the trans-Caucasus Hash meet the previous week when hashers came from all over to Baku – including Roy, the Bank’s country manager from Tbilisi. Ella told me that he lived up to his reputation as a Hash Master and also told me his Hash name: ‘World Wanker’. An interesting twist on being a World Banker. 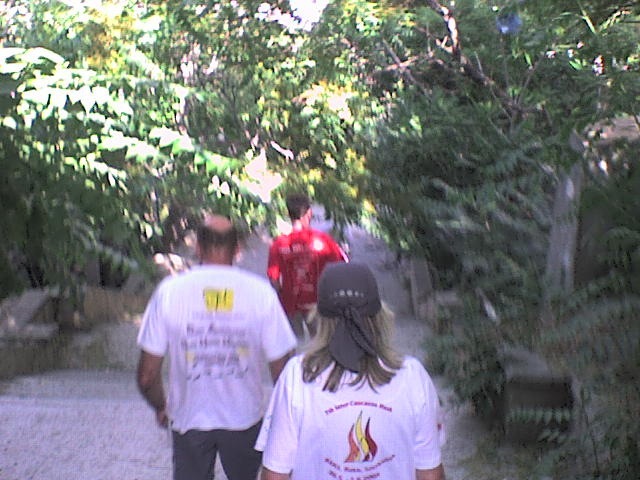 There are two hashes in Baku: Sunday which is social so there a run and walk, while Thursday is for runners. Ella said that she brings her bike and kindly collected me at 17:00 to go to the hash start. There was a small cadre of runners – less than ten – and some twenty walkers. It was, to say the least, a rude introduction to hashing in Baku. Why? Because Baku is a city built on hills. We spent an inordinate amount of time running up hills, up stairs, and then up hills. There were lots of false trails, and I had a real problem finding the trail when there was one. For some reason I just couldn’t see the markers. The picture to the right was taken from one of the hills looking towards the sea. One thing about hashing is that you see parts of cities that few foreigners see. We ran through parks, up alleys, through what were borderline slums, past garbage dumps, and impressive monuments. We even went by the Ministry of Finance where I will be having my meetings tomorrow. 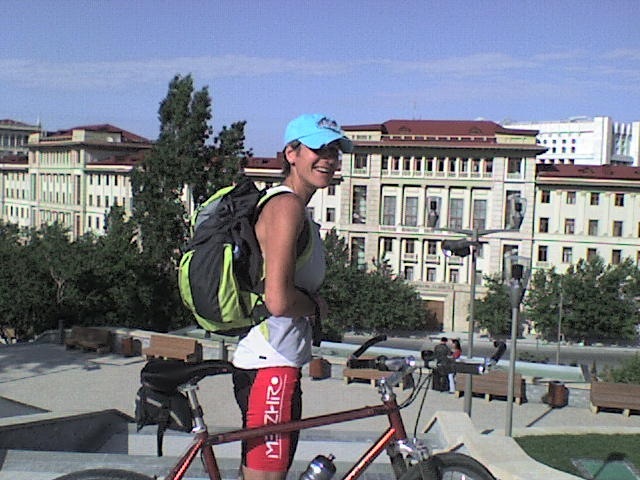 The photo below is of Ella with her bicycle and the Ministry in the background. I have recently been reading a book by Peter Hopkirk on the activities of the British Secret Service in the Caucasus region during the First World War and the Bolshevik revolution. They were very concerned about the Germans getting the Azerbaijan oil fields. The Germans and the Turks were also trying to foster a revolution amongst the Muslims in India. It was the latter that the British were particularly concerned about. 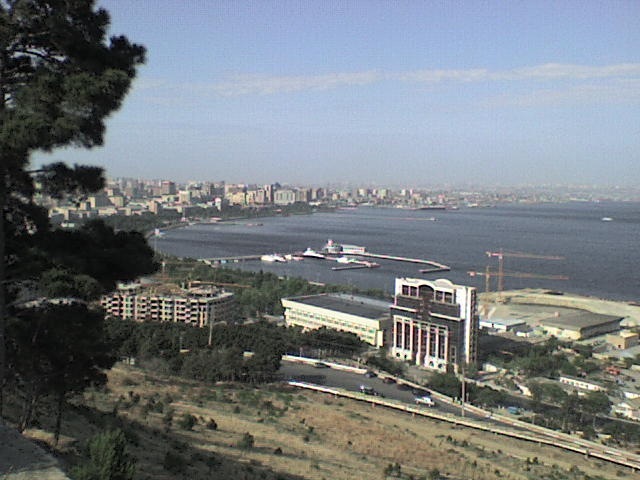 After the Bolshevik revolution there was an uprising in Baku where the Azeris were either killed or they fled the city. Afterwards, the Turkish army, supported by Azaris, headed towards Baku. The Armenians and Bolshevik’s were concerned enough to invite in the British to help defend them and the oil fields. This was done and a small British found themselves fighting a vastly superior Turkish/Azeri force. There was only some 1,000 soldiers, but they lost about one quarter killed or wounded since the Armenians and others were not at all supportive of their efforts. In the end they withdrew and the Turks/Azeri’s got their revenge. 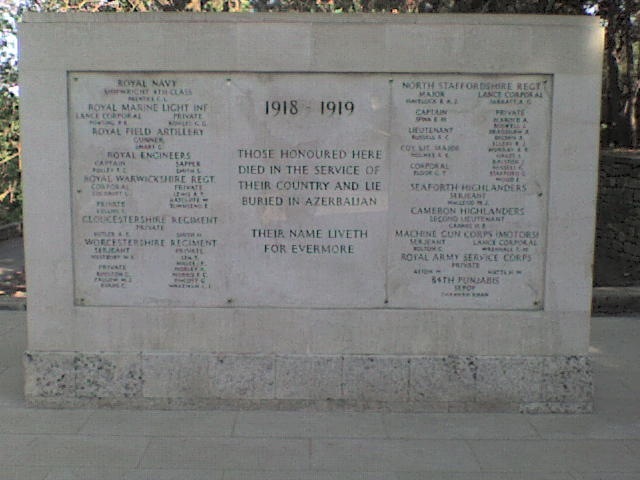 I was therefore very surprised to come across a monument to the British dead from that time–especially given that they were fighting against the Azeris. The book indicated that there was no memorial, but it was written some 15 years ago so it must have been installed after that time. I asked one of the Scottish hashers if he had noticed it but he ran right by it. I would have done the same, had I not just been reading about it. Sad to think about these young men who died in a forgotten corner of the world for no effect. After more up and down we ended the hash in a courtyard. We were there well in advance of the runners and by the time they arrived I was cooled down so I skipped the rituals and caught a taxi back to my hotel for a well earned dinner and bubble bath.